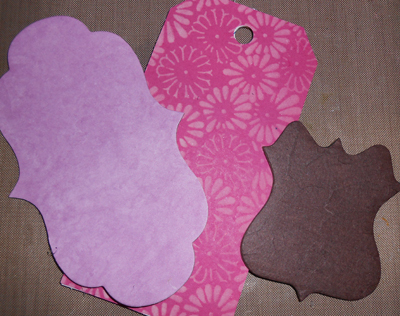 Yes, I admit, little pieces of paper and cardboard are difficult for me to part with. I may have a problem, but this recent Tim Holtz tag challenge put some of those scraps to good use. Following Tim's tutorial I found I didn't have some of the product he used. No worries, Tim's are meant to inspire. And that it did! Read on for my creative solutions. 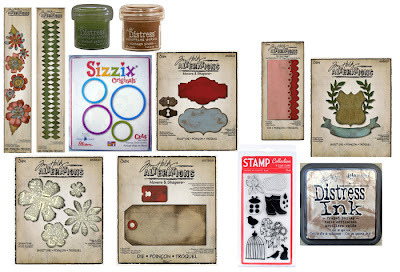 The one I want to focus on is the shield from Sizzix Tim Holtz Regal Crest die. This will become the basket. 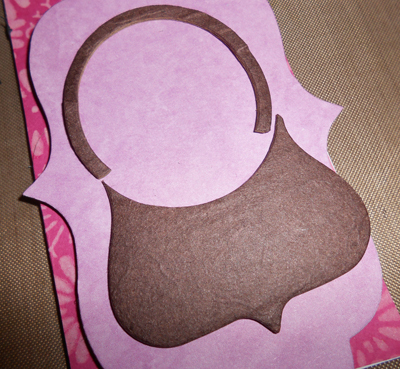 I know it doesn't look like one now, but a simple cut and it transforms. As you see in the photo, I used my old Sizzix Frames, Circle Combo 36-1065. It worked out perfectly, giving me a round shape for the basket and also cutting a piece I used for the basket handle., reshaping it carefully so it wasn't so round. 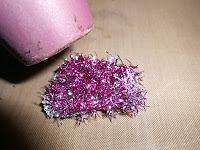 If you don't have this die, use something round you can trace around and cut it the old fashioned way. Finish basket by using a white colored pencil and drawing the basket pattern. Tinsel twine posed a bit of a challenge for me as I didn't have alcohol ink in the color I wanted. My daughter is a collector of Sharpie pens. She doesn't know it, but I found the perfect color in her stash. It applied to the tinsel easily. Next following Tim's instructions, I used my old heat tool to curl the end of the tinsel twine, making it look more like Easter grass. I'm not going to get into all the details of how it was assembled, but feel free to ask any questions. 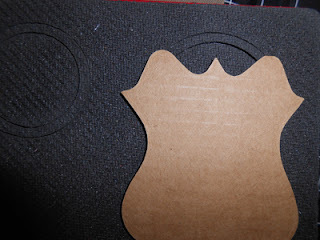 Saw your project on MIM and wanted to check it out. 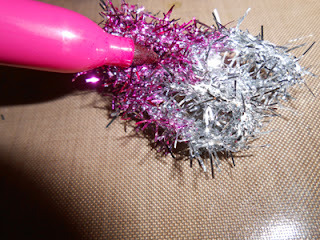 How cool that you were able to recolor the tinsel with a Sharpie! I love your basket, how creative, and colouring the tinsel, fabulous tag, love the colours..
Wow! This is a gorgeous tag. Great way to use up some scraps too! Just visiting from MIM. Wow! Your tag is gorgeous. Such a great use of scraps. Just visiting from MIM. My entries are: #211, #213, #229, and #235. 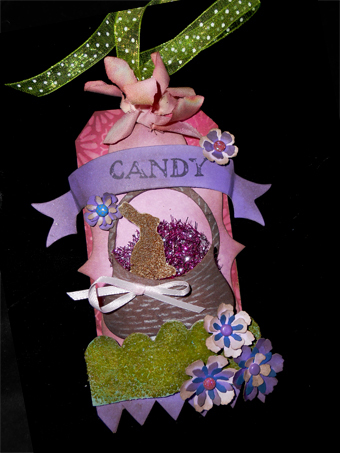 I would love to have you visit my blogs: Paper and Scraps Creations by Julia, Me and Myself on the Dark… and My Art... Healing The Soul. Such a pretty tag! That is a great easter basket! Reminds me of my childhood Easter. Have a Happy Easter!